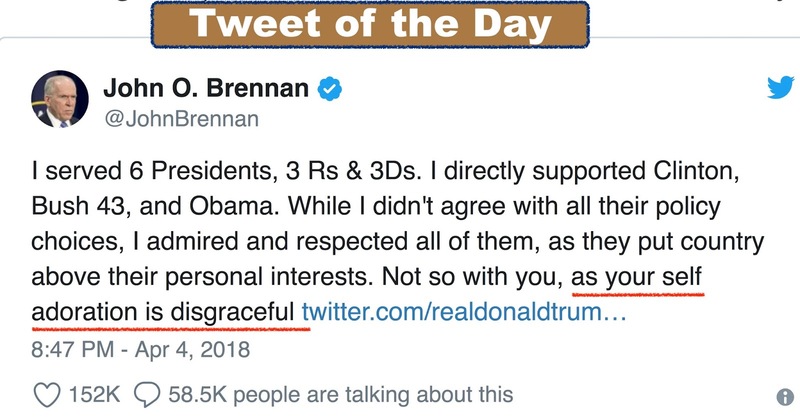 Trump Tweeted like the madman he is this morning. His blaming President Obama and attacking Hillary Clinton is no news. 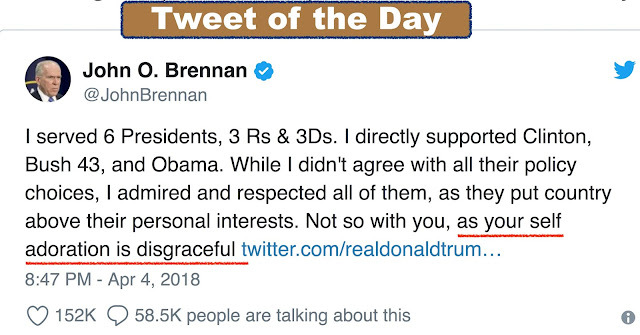 He jabs President Xi and The Washington Post in his Twitter tantrum. Nothing shocking there. However, actually naming Putin, not merely Russia, as responsible for “Animal Assad's” chemical attack, that is news. Joy Reid said it was like he said Voldemort out loud. This is getting major coverage, at least on MSNBC. It will be interesting to see how Fox News covers the story. The world now awaits to see if Putin has at long last crossed a Trump red line and how the United States will respond. How far will Trump dare to go to incur the wrath of Vlad? Read the Tweets bottom to top to see how Trump’s anger developed over the course of two hours. The Washington Post is far more fiction than fact. Story after story is made up garbage - more like a poorly written novel than good reporting. Always quoting sources (not names), many of which don’t exist. Story on John Kelly isn’t true, just another hit job! Trump's reference to the Washington Post (the poorly written newspaper, a criticism from the grammar-challenged president) is about ‘When you lose that power’: How John Kelly faded as White House disciplinarian. Trump's reference to the Washington Post (the poorly written newspaper, a criticism from the grammar challenged president) is about ‘When you lose that power’: How John Kelly faded as White House disciplinarian. EXCERPT: After White House Chief of Staff John F. Kelly pressured President Trump last fall to install his top deputy, Kirstjen Nielsen, atop the Department of Homeland Security, the president lost his temper when conservative allies argued that she wasn’t sufficiently hard line on immigration. “You didn’t tell me she was a [expletive] George W. Bush person,” Trump growled. America's racism and narcissism is the reason why its foreign affairs are a mere projection of it's domestic ills. EXCERPT: America's malignant racism and narcissism explain why President Donald Trumpcan get away with crass phrases like "America first" and "sh****le countries". Both narcissism and racism account for why the US has cared more about what happened to four Americans in Libya in 2012 than it has about Boko Haram in Nigeria or Syrian forces bombing innocent children in Eastern Ghouta. America's racism is at work when the US turns a blind eye to atrocities such as the humanitarian crisis born of Myanmar's ethnic cleansing of some 700,000 Rohingya now in Bangladesh. America's narcissism is why is there such a stark distance between America the ideal superpower, who claims to be "the leader of the free world," and America the narcissistic superpower, who only cares about herself. Technological innovations promise to make the food we eat more ethical and sustainable without sacrificing taste. We talked to Nobel Prize-nominated Johan Galtung, who predicted that someone like Trump would win the US, and that it will trigger a decline in power. Accordingly, one of the more reliable polling average methodologies, at Five Thirty Eight, adjusts Rasmussen’s findings to counter-act the “house effect.” So Friday’s 47 percent Trump approval rating goes into the averages as 42 percent. Another polling average source, Real Clear Politics, does not adjust polls for “house effects,” but similarly shows Rasmussen as being off-kilter (the current RCP average for Trump’s approval ratings is 41.5 percent). In case you want to dismiss Five Thirty Eight as a “liberal” site (despite its against-the-grain predictions in 2016 that Trump had a real chance to win), it should be noted that RCP’s management is quite conservative. What we cannot really know, of course, is whether the president really believes what he’s saying, or just wants other people to believe what he’s saying. But the circular nature of his disinformation can be seductive to people who are inclined in his direction anyway. If the mainstream news about him is “fake” and so are the non-Rasmussen polls, then there’s only one source of information you can trust: the man himself. Evil as it is, it’s as good a method as any to keep his troops feeling upbeat and ready to vote. Buzzfeed, the website that published the Steele dossier, just told me something else I didn’t know. I thought “oh yeah, he’s going to “encourage members of his administration to go” -— like who will dare incur the wrath of Kahn and actually attend the annual fest which their volatile fake-news hating boss is boycotting? Draw the short straw, anybody? You may recall that last year Trump became the first time a president to skip festivities since Ronald Reagan in 1981 because he was recovering from an assassination attempt. Then I saw who he was sending as his stand-in, none other than the befuddled sycophantic Sarah Huckabee Sanders. She will sit at the head table, and most likely have a camera on her all the time so the control room directors can capture and live stream her reactions to the jokes aimed at her godfather. Hasan Minhaj, was last year’s featured entertainer. He was praised for his balanced performance. This year of Stormy Daniels and #MeToo should be particularly interesting because a female comedian, Michelle Wolf, is the featured entertainer. She will have to address issues related to Trump's "woman problem" with the president's female surrogate sitting front and center in the audience. Those of us who find Sarah’s press conference performances cringe-worthy will be watching to see if she manages to crack one of the trademarked crooked smiles when the boss who has expressed disdain for 80% of the reporters in the room is being mocked. Maybe she will wear a burka. This is being covered by the AP and is making it onto websites like The Daily Beast. 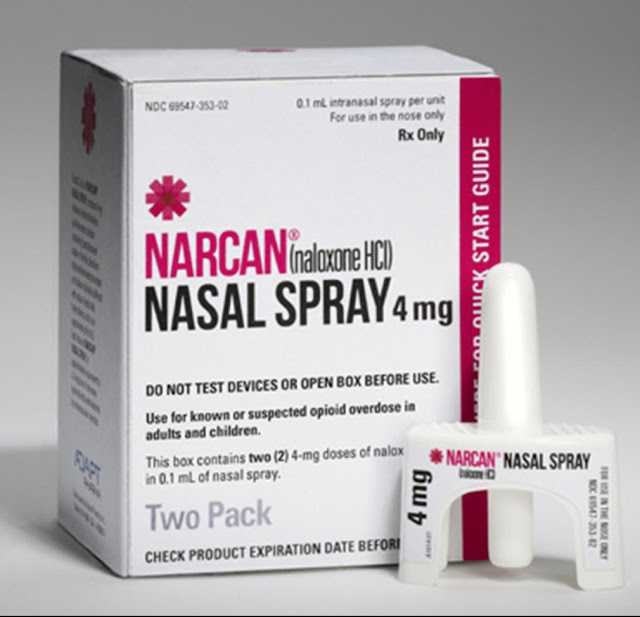 Narcan (naloxone) is the life-saving overdose reversal drug the notoriously incompetent and cruel Gov. LePage of Maine didn’t want to allow paramedics to carry. How long will he keep his job? Mr. Trump did address an oft-repeated request by state and local authorities by announcing that two drug manufacturers of the overdose reversal drug naloxone, Adapt Pharma and Kaleo, will be distributing some free units to high schools and universities around the country. Naloxone manufacturers have drawn scrutiny for their exorbitantly high prices. When CBS News contacted Adapt Pharma in January, they said that they had yet to hear anything from the White House months after Mr. Trump had announced the opioid epidemic a public health emergency. CBC News in an article aptly titled to show where is priorities are: Trump focuses on law enforcement side of opioid rollout , March 19, 2018. However, empathy and compassion aren’t in Trump’s makeup. He probably is like Governor LePage in thinking that every dead addict is one less drain on respectable society. Trump has to mention funding drug treatment just for the optics of it. His answer to the opioid crisis is to fund law enforcement, institute the death penalty for dealers, and of course, build the wall which he may or may not know won’ t stop the illegal opioid trade. I am not expecting that this announcement will be condemned by Trump or lead to his considering firing Adams. 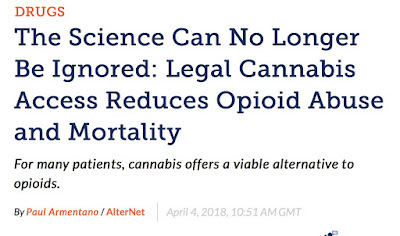 However, the next time the surgeon general makes a decision based on both good science and compassion there's no telling whether someone on Fox News will condemn him and tell Trump to fire him. This is what it comes down to. We find one Trump administration official to admire and be glad to have running a department, and end up wondering how long such a person can last in the age of Trump. NEWSWEEK Jerome Adams, the Indiana state health commissioner, was nominated last week to serve as surgeon general by President Trump to succeed Vivek Murthy, who resigned in April. While Adams has not yet been confirmed to the post, the nomination is generating interest on both sides of the political aisle as well as among the public. That's because two years ago, Adams was integral to addressing an HIV outbreak in rural Indiana by convincing then-Governor Mike Pence to provide a temporary free syringe exchange in order to slow the spread of the virus. In light of the escalating opioid epidemic that is continuing to sweep across the U.S., many people are hopeful that Adams may hold similar sway in his new national post , if he is confirmed. Naloxone is covered by most insurance plans and, for those without coverage, may be available at low or no cost through local public health programs or through retailer and manufacturer discounts. It is easy to use, safe to administer and widely available. Today’s Surgeon General advisory on naloxone is part of the administration’s ongoing effort to respond to the sharp increase among drug overdose deaths. Just last month, the Centers for Disease Control and Prevention released new data showing a rise in emergency department visits for opioid overdoses. From July 2016 through September 2017, opioid overdoses increased 30 percent in all parts of the U.S. Expanding the use of the overdose-reversing drug naloxone is a key part of the public health response to the opioid crisis, along with effective prevention, treatment and recovery programs for opioid use disorder. Research shows a combination of medication, counseling and behavioral therapy, also known as Medication Assisted Treatment, or MAT, can help people achieve long-term recovery. For more information on how to get help, call SAMHSA’s National Helpline at 1-800-662-HELP (4357) or go to https://www.findtreatment.samhsa.gov to find a treatment center. To learn more about how individuals can recognize and respond to an opioid overdose, visit www.surgeongeneral.gov to read more. The first thing I read this morning was the title of an opinion piece in the New York Times. It gave me my excerpt of the day. Mr. Edsall, the author of “The Age of Austerity” and four other books, contributes a weekly column on politics. 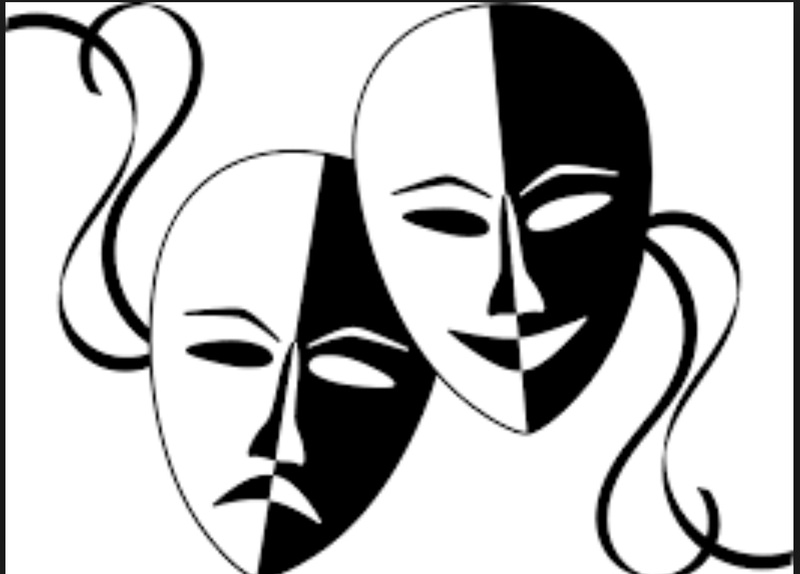 Deeply embedded in conservative and liberal politics are two different models of the family. Conservatism is based on a Strict Father model, while liberalism is centered on a Nurturant Parent model. These two models of the family give rise to different moral systems. Several approaches to contemporary politics echo the insights of Sipple and Lakoff. The crucial word now, however, is authoritarianism. \/ Frank Bruni has a good opinion piece in the New York Times, “President Trump’s Perversion of Leadership.” His first sentence got me to thinking about words. No president in my lifetime has made me think as much about leadership as Donald Trump has. That’s because no president in my lifetime has embodied the ideal of leadership as completely as he embodies its antonym. The meaning of the word leadership is straightforwardly the act of leading. When describing how a person leads it is generally prefaced by adjectives: good, bad, chaotic, incompetent, or as Bruni says "ideal." I asked myself "what exactly is the antonym of the ideal leadership?" None came to mind. I tried the website WordHippo and Thersaus.com and all they offered was: impotence, inability, incapacity, powerlessness, weakness, and subservience. None of these words are true opposites of what most people consider to be good leadership as opposed to bad leadership. Bruni describes ideal leadership in a way that hits the mark. A leader articulates a clear vision and set of principles, which become a well-lighted path that well-intentioned people can tread. Trump bellows, babbles and contradicts himself, achieving an incoherence that no level-headed person can follow. Rarely can someone deliberately coin a new phrase and have it move into general usage, though Trump has succeeded in at least one case with "fake news." There's no two or three-word phrase which adequately describes how Trump leads. This got me to thinking about what I learned from Rachel Maddow the other day about the origin of the word boycott. The word boycott entered the English language during the Irish "Land War" in 1880, and derives from Captain Charles Boycott, the land agent of an absentee landlord. (Wikipedia) While it takes some words years to enter general usage, boycott was used by The Times in November 1880 as a term for organized isolation, for example, and then throughout the Boycott boycott. Trump is so extraordinarily bad at leading well that there's no antonym for ideal leadership to describe how he does it. 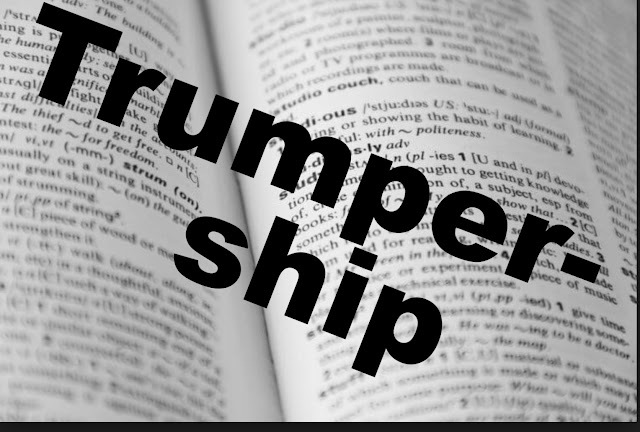 All I can think to call it is trumpership. trumpified — a person or policy that is changed to be something Trump approves of, or in the future, something he would have approved of. On Trump pandering to the far right: "his base is important to him, it's like his binky." Why did TASS report this before it hit the American MSM (Agence France-Presse even had it before it the the USA)? It is about the phone call Trump made to congratulate Putin for winning the rigged election. Was this a cover-up? Was it something Trump didn't want made public? Well, tough break, now Sarah Sanders had to cobble together an answer. I expect more fallout from this as our allies weigh in. Another question is what Russia hawk John Bolton will have to say about having Putin as a White House guest. 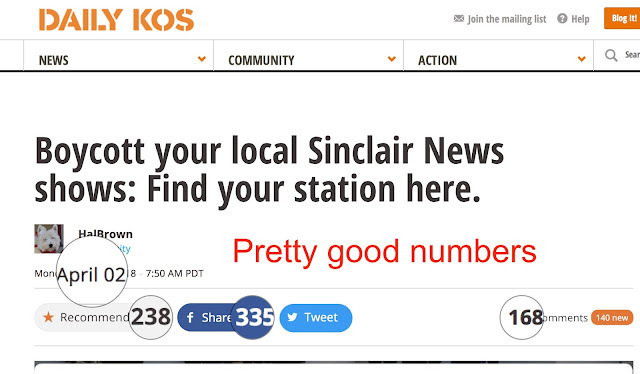 I put this article on Daily Kos where it was selected to be on their recommended list. You can read the numerous comments here. My station is KATU, channel 2, an ABC affiliate in Portland, Oregon. This is in HUFFPOST: Sinclair Broadcasting Orders Local Anchors To Record Bizarre ‘Hostage’ Video: Supercut shows broadcasters across the nation reading the same script, and it is also is being covered on MSNBC (screenshots below). Sinclair Broadcast Group is the largest owner of television stations in the United States, currently owning or operating a total of 173 stations across the country (233 after all currently proposed sales are approved) in nearly 80 markets, ranging from markets as large as Washington, D.C. to as small as Steubenville, Ohio. The stations are affiliates of various television networks, including ABC, CBS, NBC and Fox as well as numerous specialty channels. Many stations are owned outright by the company, but many others are affiliated through other companies through a local marketing agreement, a concept Sinclair pioneered in Pittsburgh in 1991 when the Federal Communications Commission (FCC) forbid duopolies. (The stations involved in the initial deal, WPGH-TV and WPTT — now WPNT— are now both owned by Sinclair outright.) 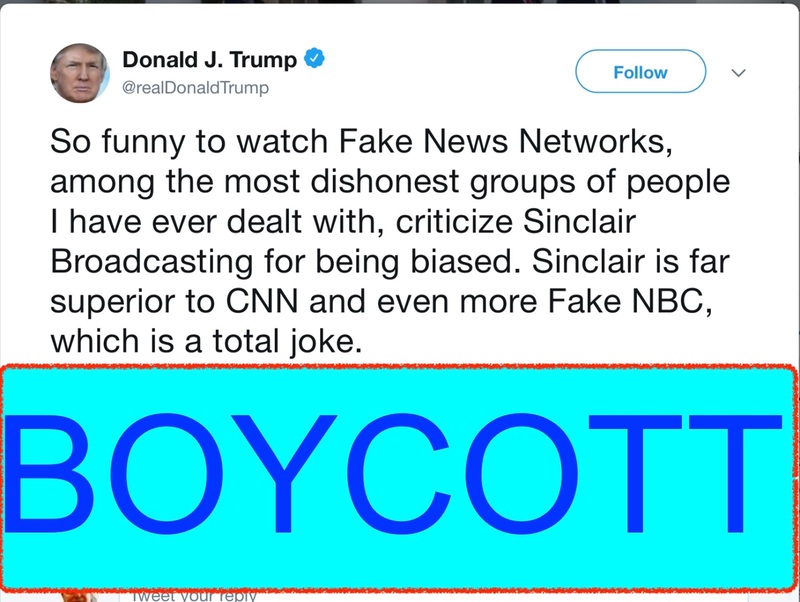 Sinclair has done this with various companies, most notably Cunningham Broadcasting and Deerfield Media. 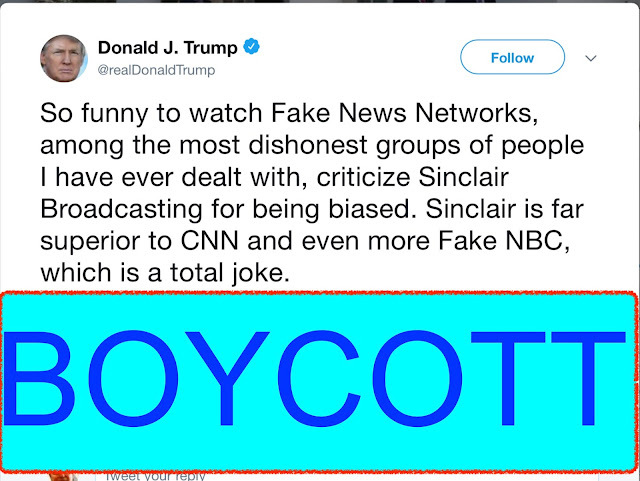 In March 2018, Sinclair Broadcasting Group required their news anchors to read a prepared script charging a proliferation of "fake news" in the media, suggesting that attacking President Donald Trump's view of events was "extremely dangerous to our democracy." Sinclair's editorial approach leans heavily toward conservative ideals. (B) Our greatest responsibility is to serve our Northwest communities. We are extremely proud of the quality, balanced journalism that _____ News produces. (B) At ______ it’s our responsibility to pursue and report the truth. We understand Truth is neither politically ‘left nor right.’ Our commitment to factual reporting is the foundation of our credibility, now more than ever. (A) But we are human and sometimes our reporting might fall short. If you believe our coverage is unfair please reach out to us by going to _________ and clicking on CONTENT CONCERNS. We value your comments. We will respond back to you. TRUMP IS STUCK WITH RUSSIA HAWK JOHN BOLTON, AND HE MAY SOON REGRET IT.